Bringing together the unstoppable force and the immovable object of, let’s say, aggressive acting choices, Willem Dafoe has signed on to Nicolas Cage’s upcoming crime thriller Dog Eat Dog. Directed by Paul Schrader, the movie will adapt Eddie Bunker’s novel about a trio of criminals forced to go on the run after a botched kidnapping. There’s no word yet on which of the ill-fated miscreants Dafoe will portray, or any discussion of how much of the production’s budget has been earmarked to replace the scenery that he and Cage toothily devour. 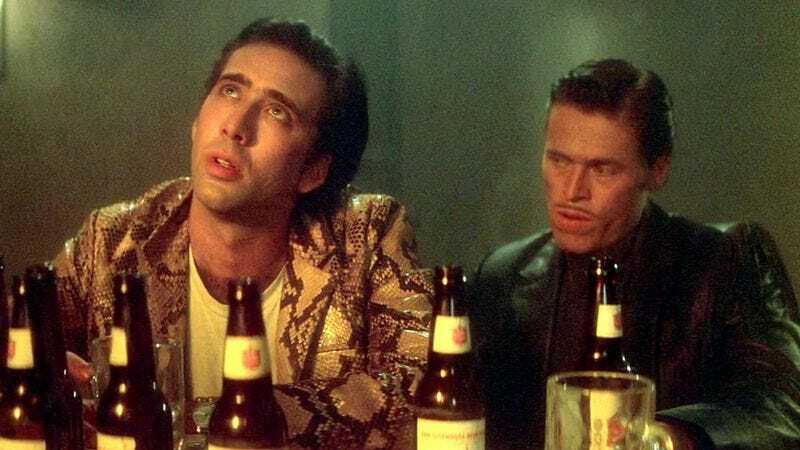 The two actors previously worked together on David Lynch’s Wild At Heart, where Dafoe’s loathsome Bobby Peru managed to edge out Cage’s Sailor Ripley on sheer, wide-eyed madness. But that was 25 years and at least one Drive Angry ago, and there’s no guarantee that Cage’s bee-loathing brio won’t overwhelm the relatively restrained performances Dafoe has favored of late. In any case, Schrader is hopefully taking steps to preserve Dog Eat Dog’s sets after the movie wraps, both to serve as a memorial to those who were lost in the acting-on-acting clashes and as a stark warning to those who might dare to follow in its cinematic footsteps.